Exquisite natural (rough) purple Fluorite specimen from the US. This super crystal has a beautiful iridescence and when held to the light seems to glow. It has perfect trademark cuboid terminations found in natural Fluorite and has a small patch of the 'Mother' rock or matrix attached at the back. This specimen fluoresces blue/pink under UV light. Out of interest, the word 'fluorescent' derives from 'fluorite', as this was one of the first minerals that was found to have this quality. Often refered to as 'the most colourful mineral in the world', Fluorite can be found in a veritable array of colours from purple, blue, pink, yellow, colourless, brown and green, not to mention the banded, multi-coloured specimens. In the healing world Fluorite is one of the most versatille crystals. 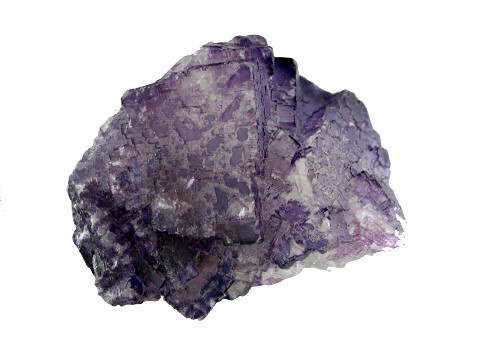 It has a similar to, but higher vibration than Amethyst; with its psychic properties making it one of the most protective stones - especially the purple type, like this one. Also on a psychic level Fluorite can help us to discern that which is true intuition from that which is influenced by thought or ego. It stabilizes the aura and is one of the most effective guards against background radiation (electromagnetic smog from computers, televisions, etc). Excelllent to have in the home, healing and work environments, Fluorite absorbs negative energy from stressful situations, cleansing the etheric body as it goes. It can help awaken our spiritual gifts, or heighten existing ones and is an excellent aid in meditation as it protects us from negative spirits or energies.